South Africa’s Paula Reto loved every minute of the four days at the final major of the season, including the majestic march to victory by South Korea’s In Gee Chun at the Evian Championship on Sunday. Chun shot the lowest ever 72-hole score at a major with a total score of 21 under par, breaking the record of 20 under set by Sweden’s Henrik Stenson at this year’s Open Championship and Jason Day from Australia at the 2015 PGA Championship. The 2015 US Women’s Open champion closed with a final round two-under-par 69 to win by four shots, better the women’s record by two strokes. ‘It was unbelievable to watch In Gee,’ said Reto, who looked in danger of missing the cut for a second successive year after an opening 74 at the Major Course of the Evian Resort Golf Club. Reto managed to safely extend her stay in Evian-les-Bains with a second round 70, while compatriot Lee-Anne Pace also joined the weekend action with rounds of 71 and 68. The South African Olympian improved from joint 57th to a tie for 51st with a third round even-par 71 and finished her campaign in joint 43rd at three over 287 after closing with a 72. Pace tied for 43rd on two over 286 with rounds of 73 and 74 on the weekend. ‘I really had a great event and I was so happy to make the cut in my second appearance, especially since I was battling with an ear infection last week,’ said Reto. ‘It’s such a tough course, with very narrow fairways and, with the weather we had all week, you really needed to keep it in the fairway and hit the greens. I didn’t start very well, but I improved every round and some of the changes I’ve been working on the last four weeks, starting to work, as well. ‘I think it will probably take another month or so to really feel comfortable with the changes, but I was glad to see my game improve during the championship. All and all, I love the atmosphere in France. The tournament is so well run and the organisers really try their best to help the players. 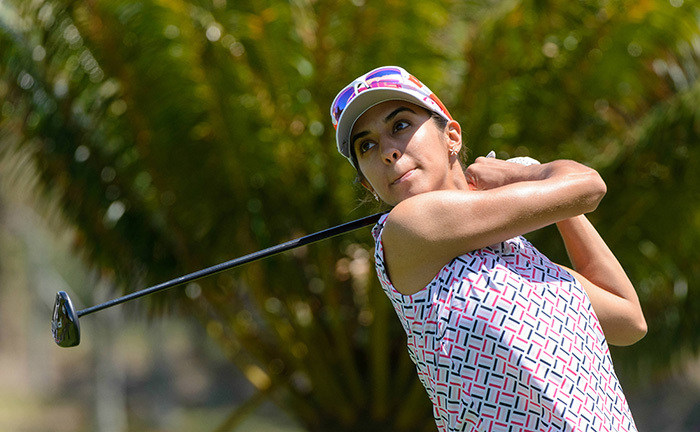 Reto will be lining up in the Reignwood LPGA Classic in China at the end of September, followed by the Fubon LPGA Taiwan Championship, the LPGA KEB Hana Bank in South Korea, and the Blue Bay LPGA at the end of October, which Pace won in 2014.